What is a Kentucky Eviction Notice? Kentucky Eviction Notice: What Is It? A Kentucky eviction notice is a written document that a landlord gives to the tenant of the rental property when the tenant violates the lease in some way. The most common reason a Kentucky eviction notice is given is because of unpaid rent. Eviction notices are also known as a notice to quit. All Kentucky eviction notices are regulated by the state’s landlord-tenant laws. A landlord may not begin an eviction lawsuit against the tenant until they first serve the tenant with a written eviction notice. What Are the Components of a Kentucky Eviction Notice? The purpose of an eviction notice is to inform the tenant bound to the lease agreement that they’ve violated it and have a certain number of days to correct the violation or vacate the property. Because an eviction notice is the first step in the legal eviction process, it needs to have certain information in it. It must also be served on the tenant in a way that complies with Kentucky landlord-tenant law. The date the eviction notice is issued. The legal name of the tenant(s) who signed the lease. This is the person or persons legally bound to abide by the lease. The address of the rental property. This should include the city, zip code, and the county where the property is located. The reason why the eviction notice was given (such as non-payment of rent). How many days the tenant has to remedy the problem. The name and contact information of the landlord or the landlord’s agent. A completed Certificate of Service that gives the date the eviction notice was served, how it was served, the name of the individual that was served (if it was served on a person), and the signature of the individual who served it. The eviction notice must be legally served. In Kentucky, this means serving the tenant in person or to another person of a responsible age who lives on the property, mailed via registered or certified mail with a return receipt certification, or attached to the front door or another conspicuous location. A 7-day notice to quit for non-payment of rent is an eviction notice used to inform the tenant that they have 7 days to pay the rent that hasn’t been received. This eviction notice is subject to KRS § 383.660(2). It should include the components discussed above. It should also include the total amount of rent that is past due and explain how and where the tenant may pay the past due amount. A 15-day notice to quit for non-compliance is an eviction notice used to inform the tenant that they violated the lease in some way (other than not paying their rent; non-payment of rent receives a 7-day notice). This notice is regulated to KRS § 383.660(1). A 15-day notice to quit for non-compliance should explain the violation of the lease and give the date by which the violation must be corrected. If the tenant violates the lease again within a six-month period and the violation is the exact same or extremely similar to the initial violation, the landlord can issue a 14-day unconditional notice to quit for a 2nd violation. This notice does not give the tenant a second chance to correct the violation. It gives them 14 days to vacate the property. This notice is regulated by KRS § 383.660(1). A 30-day notice to terminate a lease is used for month-to-month tenancies. It’s not quite the same as an eviction notice because an eviction notice is used to address a lease violation. This letter can be used by either the landlord or the tenant if they wish to end the month-to-month tenancy. 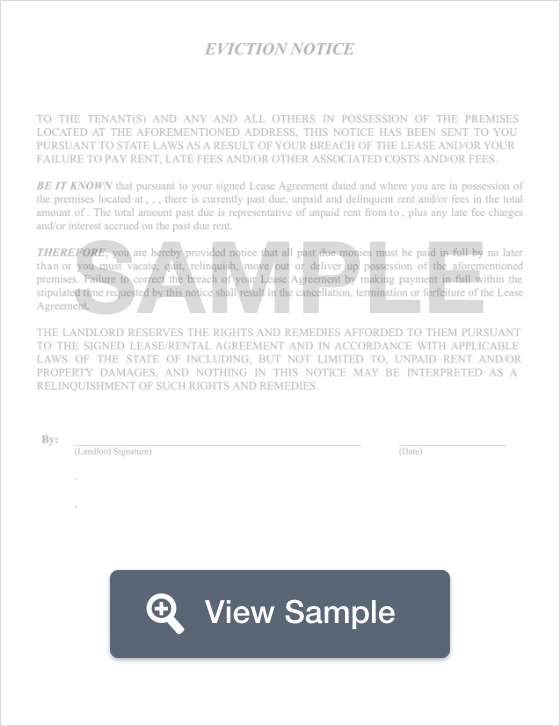 This letter should include the date by which the tenant must vacate the property. This letter is subject to KRS § 383.695(2). What Are the Legal Considerations of a Kentucky Eviction Notice? Not all evictions are legal. Landlords may not evict a tenant because the tenant reported the property or the landlord to housing or code enforcement for code violations or for reasons that are discriminatory at the state or federal level. Discrimination generally consists of making a decision based on a person’s family status, race, skin color, religion, gender, national origin, or age. Without a court order, the landlord may not change the locks, remove the tenant’s belongings, or shut off the utilities. Those methods are known as “self-help evictions.” If a landlord uses those methods without a court order, they can be sued by the tenant. If you are renting a residential property in Kentucky and you receive an eviction notice, read it carefully. It’s important that you understand why you’ve received the notice. You’ll also learn the deadline by which the problem must be corrected. In Kentucky, if you violate the lease in a similar fashion or in the same fashion twice within a six-month period, the landlord may issue a notice for you to vacate the property without giving you a second change to correct the problem. If you don’t understand the eviction notice or if you want to try to work something out with the landlord, use the contact information in the notice and call them. Remember to remain calm throughout the discussion. Not all evictions are legal. We discussed illegal eviction sunder Legal Considerations. If you believe that your landlord has broken the law by trying to evict you, contact a landlord-tenant lawyer. If you cannot afford an attorney, you have a couple of options. Your first option is to contact Salmon P. Chase College of Law of Northern Kentucky University, University of Kentucky College of Law, or Louis D. Brandeis School of Law at the University of Louisville. Ask if they have a law clinic. Clinics are ran by third-year law students who are supervised by licensed attorneys. They provide free or low-cost legal services for Kentucky residents. Your other option is to look for a legal aid office near your home. Many legal aid offices have limited resources and only help people who fall below a certain income level. However, many also have excellent resources that are available to the public regardless of income level. Kentucky landlords must comply with the state’s landlord-tenant laws. Eviction notices must contain the information discussed earlier in this guide and they must be served in accordance with the law. It’s extremely important for landlords to remember that an eviction notice is the first step in the eviction process. Revisit the section entitled Legal Considerations. It has important information that landlords should know regarding what constitutes an illegal eviction. If a landlord illegally evicts a tenant, they open themselves up to the possibility of a tenant filing a lawsuit against them. For more information about Kentucky eviction notices, talk with a landlord-tenant attorney in the county where the rental property is located.